My kids love Brussels Sprouts but they might just be a conduit for the butter we serve with them. As a kid, I was not eating Brussels sprouts with or without butter. Now I love them and my wife made some for Thanksgiving that could be the best variation I’ve ever enjoyed. I’ll share that with you next post. As you will learn from this fantastic article by contributing writer Chef Mark Vogel, most American Brussels sprouts come from California and most of them are sold in the frozen section of your market. I guess these are good in casseroles and soups but if you are going to serve them by themselves, you have to look for fresh sprouts. The difference is night and day. It never ceases to amaze me how many foods and classic recipes have histories embroiled in mystery, controversy and general contrariety. Most of the time when researching a particular comestible, I find myself lost in a universe of permutations. Consider the etiology of something as seemingly simple as the Brussels sprout. After reviewing five textbooks, an encyclopedia, and a well known food history website*, I was able to determine that Brussels sprouts originated in Europe in either the 5th, 13th, 15th, 16th, 17th or 18th century. Well that narrows it down. What is known is that cabbage, the ancestor of Brussels sprouts, is indigenous to the Mediterranean and has been cultivated for at least 2,500 years. Cherished by the ancient Greeks and Romans, it was propagated by the latter throughout Europe. Whatever the temporal period, Brussels sprouts were cultivated in Belgium and hence were eponymously named after its capital city. The French introduced them to Louisiana in 1800. Today most American Brussels sprouts hail from California and end up in frozen products. Ironically, despite their Belgian roots, the Netherlands are the key producer in Europe. Brussels sprouts have an unjust reputation for mawkishness. 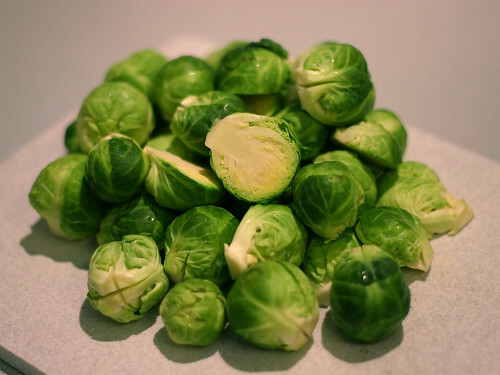 Many people who dislike them have only been exposed to improperly stored or cooked Brussels sprouts. While I’m sure some will recoil even under the best circumstances, you owe it to yourself to revisit them under ideal conditions. First they must be fresh. Brussels sprouts grow on stalks and sometimes supermarkets will sell them with the stalks attached. Clearly this is preferable. If sold loose or worse yet, in pre-wrapped packages, inspect them carefully. If the leaves are yellow, discolored or loose, or if the root ends are brown or appear dry, avoid them altogether. If possible, choose smaller specimens as they are tenderer than their big brothers. Once purchased, endeavor to use them promptly. Do not hold them beyond three days in the fridge or they can develop off flavors. On yet another disparate note, some sources advise storing them in a plastic bag and others do not. Just use them expediently and bypass this contention. Next is how and with what to cook them. Brussels sprouts can be cooked by water via steaming or boiling but as with most foods, dry heat methods such as roasting, sautéing, broiling, or even grilling is best. Water leeches flavor (not to mention vitamins and antioxidants), and cannot produce the intensity of flavor that dry heat methods can. Indisputably Brussels sprouts are most sumptuous when combined with a rich pork product such as bacon, prosciutto, or pancetta. Or try sautéing them in chicken or duck fat. Another decadent alternative is to cook them in a gratin smothered by butter and cheese. Quite simply, their stouter essence marries harmoniously with luxurious ingredients. This is not merely due to the fatty sidekick, but the synchronicity achieved between the flavors of the Brussels sprouts and the fat. Finally, avoid overcooking them. As with all forms of cabbage, excessive cooking generates malodorous compounds. Brussels sprouts are rich in fiber, folic acid, and vitamins A and C. They are a cruciferous vegetable, i.e., a family of veggies that are reputed to have anti-cancer properties. Others include mustard greens, broccoli, cauliflower, rutabagas, turnips, chard, and kale. Brussels sprouts are best served with more robust fare such as red meat or roasted pork and poultry. However, if your palate is amenable, they can be very thinly sliced and served raw in salads. Preheat the oven to 375 degrees F. Place the cherries and currants in a small saucepan and add the wine. Bring to a boil and then remove from the heat. Let the fruit steep in the hot wine for about 15 minutes. Meanwhile trim the Brussels sprouts. First make a thin slice off the root end. Then cut them in half vertically discarding any outer leaves that fall off naturally. Remove any remaining outer leaves that are discolored. If any of them are notably larger than the rest, cut them into quarters. Once cut, wash them by submerging them in a bowl of water and then drain and pat dry. Combine all of the ingredients except the oil in a bowl and toss. Add the olive oil in increments and stir, adding just enough to evenly but lightly coat everything. Remember the bacon will render its drippings. Place everything in a baking dish and place in the oven for 20 minutes or until the sprouts reach your desired tenderness.